How many students attend Darlington? Opening enrollment in 2018-2019 was 723 (Pre-K to 12) with 297 students in Pre-K to 8 and 426 in grades 9-12. 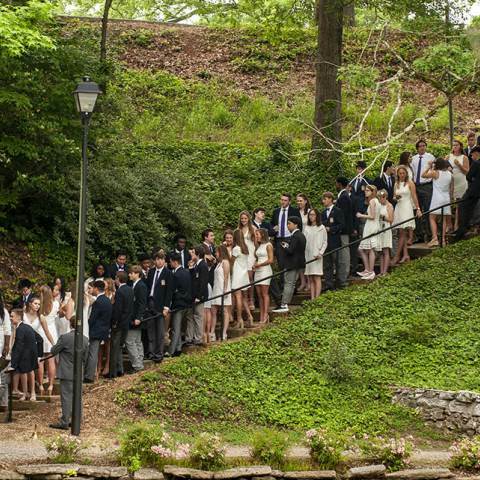 The Upper School community, which is 52% male and 48% female, included 241 day students and 185 boarding students from 21 states and U.S. territories and 26 countries. One hundred of these boarding students were international. What is Darlington’s current tuition? For the 2019-2020 academic year, tuition for pre-K and kindergarten is $11,690, grades 1-5 is $16,370, and grades 6-8 is $20,330. For grades 9-12, Upper School day is $21,700. domestic boarding is $52,820 and international boarding is $61,120. Click here to read more about Darlington's tuition and explore opportunities for financial assistance. Yes, Darlington is committed to making educational opportunities available and more affordable to as many academically qualified students as possible regardless of a family’s financial resources. Between our payment plan, need-based financial aid program and merit scholarship opportunities, Darlington may very well be within reach for your family. Please click here to read more about these affordability options. A campus visit is important to the admission process because it allows you and your family to see yourselves as part of the Darlington Community. We offer a wide range of visitation options, from private visits to open houses. Simply, click here to request your visit today. We look forward to seeing you! The application fee is $50 for for all day students and domestic boarding students and $100 for international boarding students. The priority deadline is Feb. 15. The initial round of admissions decisions will be sent by March 10. Complete applications received after March 10 will be reviewed on a rolling basis as space remains available. Is a post-graduate year offered at Darlington? Each year, we enroll a handful of post-graduate students. Typically, these students take senior-level courses for one year to strengthen their academics before beginning college. For day students, Darlington offers daily bus transportation to and from Bartow, Gordon, Cobb and Chattooga counties for an additional fee. Click here for more details. The school's preferred shuttle service for airport transportation for boarding students is Airport Star Shuttle.